Saffrons player Paul Shiels has retired from inter-county hurling because of work and family commitments. The 29-year-old Dunloy clubman was a key player for Antrim and his decision to quit is a major blow to the county's ambitions. "As a person and a friend he doesn't owe Antrim anything - everything comes to an end," Saffrons joint-manager Terence McNaughton told the Irish News. Hip operations led to Shiels missing the 2009 and 2016 seasons. 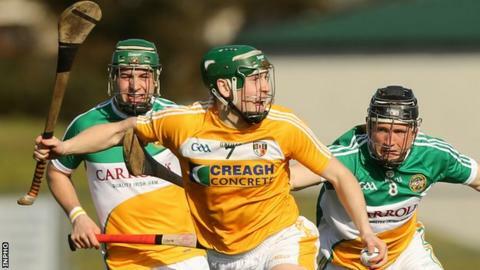 The versatile Shiels helped Antrim to gain promotion to Division 1B of the Hurling League in April. He was also part of the Dunloy team which won the Antrim club title for the first time in eight years last month. However, Dunloy lost out to champions Slaughtneil in the Ulster club hurling semi-finals earlier this month with Shiels scoring their only goal. "He has a brilliant hurling brain and he's one of the nicest guys I've ever managed," added McNaughton. "He would never get get caught on the ball. He was just a brilliant player for Antrim."